All the images from the telescope with very bright stars show the type of "streamer" pattern radiating from them as shown below. This was with the 0.7 reducer. I'd let the telescope acclimate from 6:50pm through 8:50pm before taking 3 images of the Pleiades that this is made up from. Even around 10:30pm bright stars in the images still look like that. At both times the defocused stars didn't show any signs of heat plumes inside the scope. As an additional data point, while collimating the scope a number of spots appeared in the airy disk on both sides of focus. I have some images taken without the reducer, but there weren't any stars bright enough to potentially cause the issue to show. Just looks like filaments of the foreground Merope Nebula illuminated by the Pleiades to me. I'm not an imager, but I see this nebulosity visually in my scopes and binos so I'd expect it's quite bright and obvious with a camera. 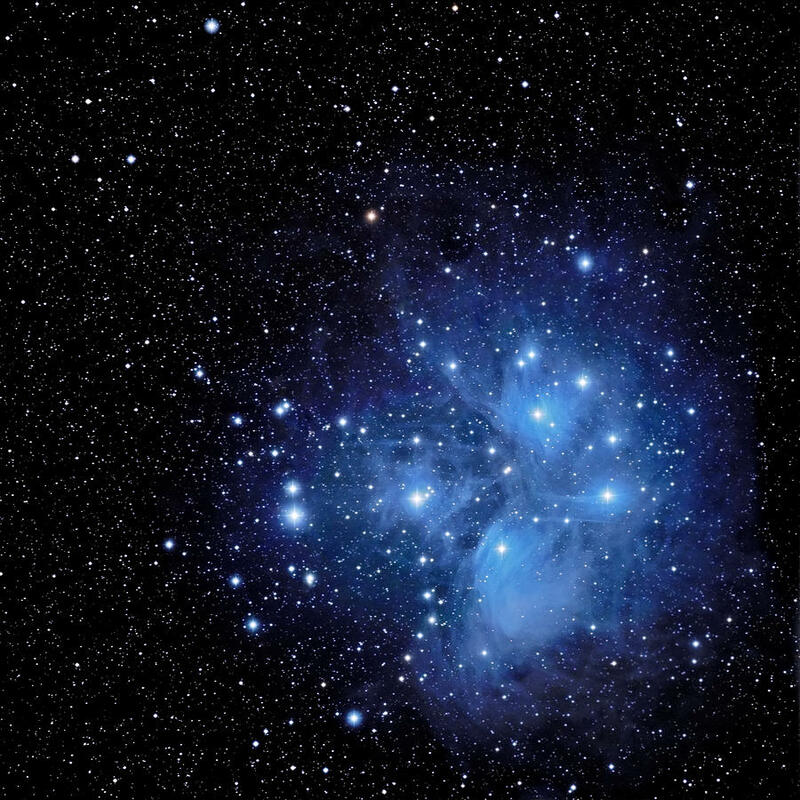 I've imaged the Pleiades with my 100mm refractor a number times, and I don't get those sorts of "streamers" on the stars. How about this from the Flame nebula (2 stars show the same behavior). He means the "notches" in the flare around the stars, not the nebulae. That is a problem, but I don't know what kind. Try the same pictures without the reducer just to make sure what's at fault. There was a bad batch of reducers, but I don't remember exactly when or which ones. I had to wait a long time to get the one for my Edge 8 after I bought the scope last year. Some people have gotten them replaced even out of warranty. They were just made badly. Maybe they were made to correct Hubble. I've annotated some cropped portions of the images below. Interesting. Did you happen to test the same star in different locations in your FOV? Each one of the above images are from different areas of the FOV. It occurs across the entire image. Prior to stretching the image they aren't as noticeable, but they are there. I'll have to wait for the sky to be clear (cloudy tonight, looks like it'll be clear tomorrow night) to try again without the focal reducer. These are diffraction artifacts. Something is intruding into the edges of the light cone. I don't know exactly where they are coming from, but this kind of artifact is routinely reported here on CN an the culprit is just about always diffraction. Try defocusing a star to see if you can see it on the edges. That might give you a hint as to where it is coming from. Remove the camera and visually sight though the system with your eye at prime focus and perhaps you can see the intrusion. After reading your reply, I managed to find other images from SCT's that show the same "notches". Looking through the tube with the camera removed didn't show any obvious obstructions. I got a few star images last night with and without the reducer, and confirmed the issue exists in both configurations. Which didn't surprise me at the time given your post. Here are two images of the same star defocused to different degrees. Well, as you can see, something is intruding into the light path. I don't know what it is, but I am confident that this is what is happening. My guess would be that some component in the light path between the rear cell of the SCT and the camera focal plane is intruding into the edge of the light cone. Now it is possible that it is inside the telescope, but these artifacts are almost always a function of some component in the imaging train. Look carefully at your configuration. If there is any component in the train that is less than 2" in diameter (up to the face of the camera) than you should look at that as a potential source. I would also take a flashlight and look into the rear of the scope into the lens stack of the built in field corrector to make sure that there is no issue there. As I suggested though, this looks like some kind of diffraction artifact from some component intruding into the edges of the light cone. Your star test clearly shows parallel straight edges on either side of the Fresnel pattern. Can't tell you what is causing it, but that is what you are almost surely looking for. The black gaps are just a geometric effect which is normal for some telescope / corrector combinations, as well as for Petzval type APOs like Takahashi FSQs. The gaps are always point symmetric with regard to the image center. 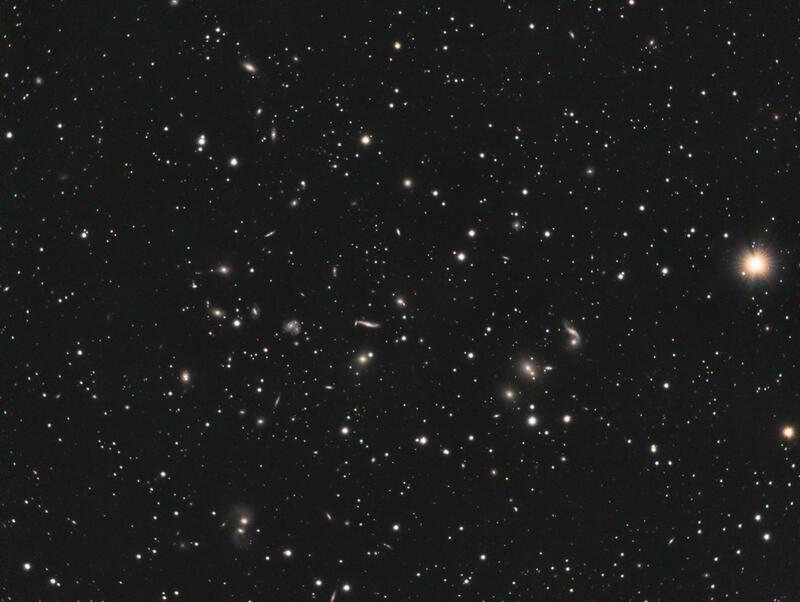 I have taken the attached image of Abell 2151 with my Meade 8" ACF and AP 0.67x reducer where you can see similar gaps at the two brighter stars on the right side. Bright streaks are diffraction effects as it was correctly written before. These can be caused by edges, e.g. OAG prisms, protrusions and even hairs. I took a closer look at the mirror. It's rather dirty for a brand new telescope (IMO), but what's got more of my interest is several areas that look like scratches, cracks, or something smeared on the mirror near its inner region, and a few bits of string/fuzz caught between the mirror and mounting ring. Nope, the streaks on the mirror are almost surely not causing it. The cut off fresnel pattern is the culprit. You just have to find out what's causing it. As a general rule, if you cannot see the shadow of something (hair, scratch, crud, etc) in a very defocused fresnel pattern, it's not going to be visible at the eyepiece and probably not going to show up in images either. The edges look cut off on the two sides. Are you using a dew shield? Maybe it is deformed if so. Can't see what else would cause flat edges on two sides. I have seen misshapen dew shields ruin star images before. Edited by jtrezzo, 14 December 2018 - 03:31 PM. There was no dew shield for those images. Yes something is clearly cutting into the light path. Look for that.